News you won't find on CNN! Arwa El-Masri, in typical female style, made sure her outfit for the NRL's recent Dally M Awards was perfect from top to toe. There were the stilletos, Leiela designer gown - and for the devout Muslim, mother and wife of Bulldogs star Hazem El Masri, a couture veil tailored to complement the outfit. She was aware it was not the usual outfit seen on the WAGs of the red carpet. Along with the scarf, the gown was altered with longer sleeves and a higher neckline, in line with her requirements for creating an elegant but modest look. "If I am going to dress in an alluring way I want to dress that way just for my husband," she said. Mrs El Masri was happy to explain why she adopted the veil as a Muslim woman. "It is a way that I can control how I represent myself and it provides protection from objectionable attention," she said. She decided to attend her first Dally M Awards, at the State Theatre, not just to celebrate with her husband but also bring more positive attention to the game. In particular she is upset by the bad rap most league players have received because of the actions of a few. "There are plenty of men who treat women with dignity," she said. Hazem el-Masri, the highest point scorer in NRL history, and wife Arwa were interviewed on Channel 9's Today programme. The month of October is synonymous with Breast Cancer, the most invasive cancer among Australian women. Over the past two years, Crescents of Brisbane has dedicated the month of October towards the breast cancer cause. 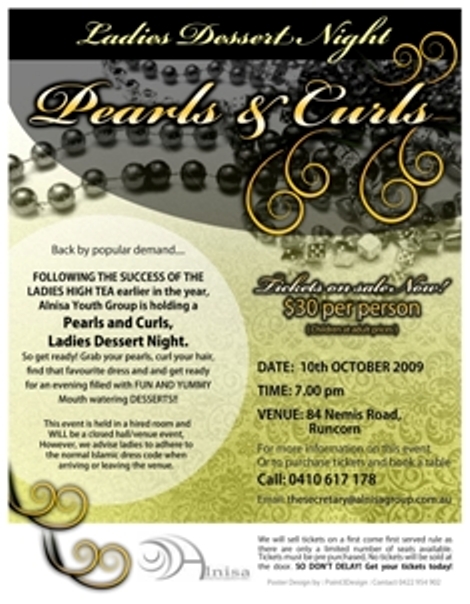 In 2007, the Crescents Breast Cancer Awareness Workshop hosted 200 ladies and in 2008 the Crescents Pink Ribbon Pamper Brunch raised over $2500 for the National Breast Cancer Foundation. This year Crescents of Brisbane will be hosting a ladies fundraising luncheon, a day to honour women...the "Celebration of Being A Woman". Funds raised from this year's event will be donated to Mummy's Wish - a not-for-profit charity focusing on supporting mothers diagnosed with cancer while either pregnant or with young children in South East Queensland. In addition to the scrumptious two-course meal, the program for the day promises to be fun, informative and inspirational! Speakers include a Life Coach, Body Image Consultant and Fitness Expert. All those attending will also be given the opportunity to enjoy mini-facials, mini-makeovers, personalised demonstrations and advice from Galvanic Spa, Larissa Bright Cosmetics and Beauty Spells Mineral Makeup. Lucky draw prizes will be plentiful and everyone gets to take home a special memento from the day. Mr Ikebal Patel, President of Muslims Australia expressed sadness and condolences at the loss of life and tragedy as a result of the devastating earthquake and the resulting tsunami that hit Samoa and the surrounding Pacific islands and the quake that struck Sumatra this morning. Mr Patel said the destruction of homes, amenities and basic resources will require an enormous relief and reconstruction effort. 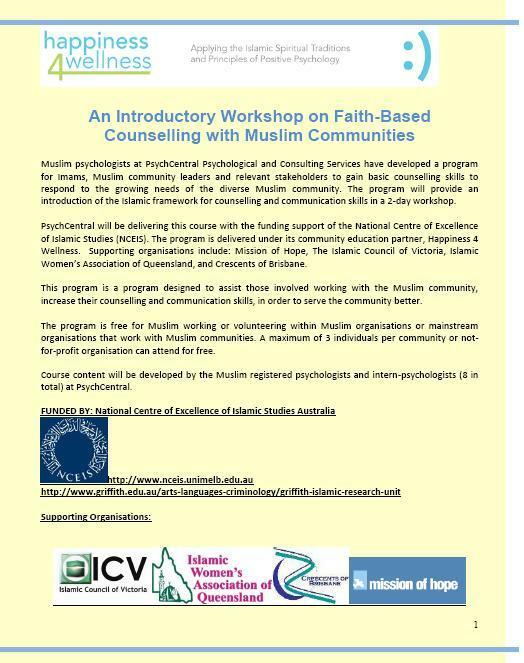 Mr Patel further stated that Muslims Australia is engaged in a fund raising effort to alleviate the suffering and ease the conditions of those in dire need. Mr Patel also expressed sadness at the loss of life associated with cyclone Ketsana, which is barrelling towards Laos after leaving a trail of destruction and death across Philippines, Vietnam and Cambodia. Mr Patel indicated that Muslims Australia in consultation with its State Islamic Councils will be arranging relief aid as a matter of urgency for the victims across the Pacific and South Asia. The wedding ceremony of Muhammad, only son of Hoosein and Yasmin Sabdia and Fayyaadhah, daughter of Faizul and Yasmin Doola took place on Friday at the Kuraby Mosque. Imam Uzair of Holland Park Mosque performed the nikkah. The reception was held on Friday evening at the Indooroopilly Golf Club and the Walimah last night (Saturday) at the newly refurbished Raj Palace on the Gold Coast. Fayyaadhah is studying to become a social worker and Muhammad is a quantity surveyor. The couple head off for Malaysia today (Sunday) for their honeymoon. 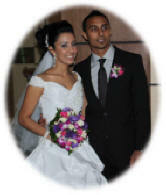 To have your wedding pictures and stories published in CCN send them to ccn@crescentsofbrisbane.org. GOLD COAST: A group of Keebra Park State High School students are trying to turn the tide on the number of people from Arab nations drowning on Australian beaches. The girls took part in a multicultural swimming program at Southport yesterday, with Gold Coast lifeguards teaching them about swimming, sun, signs and surf safety. Over two days the six girls learned a combination of skills in the pool and in the surf, and trialled a new line of swimwear made locally to help, rather than hinder, Muslim women in the water. Year 10 student Yennifer Carnero had little swimming experience until she completed the program and said she learned a range of skills that would be useful next time she went to the beach. "We learned swim safety, freestyle, safety jumps, floating, breathing and dolphining," said the 14-year-old. 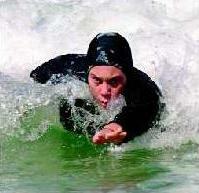 "I had a target to dive under 10 waves and I did that, even though the water was cold. After a while you got used to it." 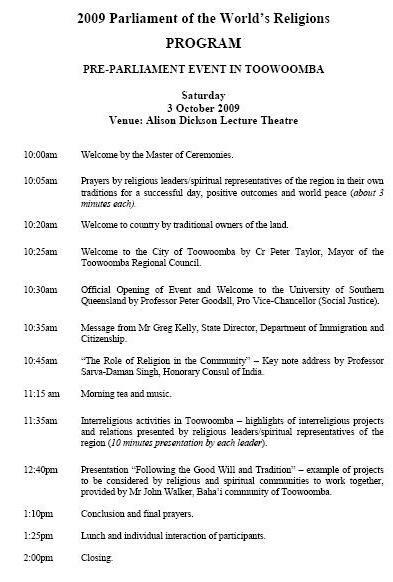 The day of learning was part of the Aqua English Project, which was started in 2006 as a result of international tourist drownings on the Gold Coast. A partnership with the Gold Coast City Council Get Active & Healthy Program and the Aqua English S'women Program, participants involved have come from Afghanistan, India, Iran, Denmark, South Africa, Tanzania, Papua New Guinea and Taiwan. Aqua English Project manager Sarah Palaubaum said they sought to solve a fundamental misunderstanding between international cultures and Australian culture when it came to the water. 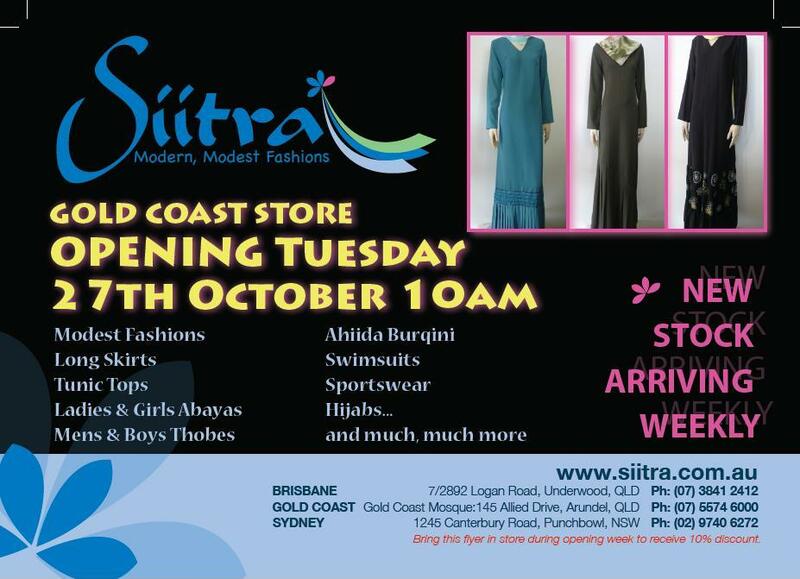 "The most exciting development for the program has been the design of Islamic swimwear, exclusively made on the Gold Coast." 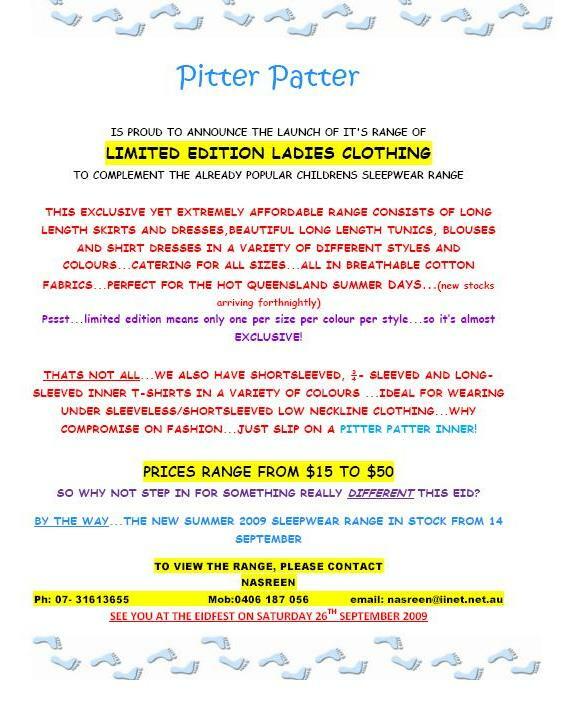 Ms Palaubaum said the innovative swimwear would be supplied to all female Muslim students of Milperra High School, Brisbane. In a report released by the Royal Life Saving Society last week, people from Arab nations are among the most at risk in the Australian surf. Information in the 15th annual report urged Arabic-speaking communities to take water safety classes. Across Australia 302 people drowned, up by 41 on the previous year, with anecdotal evidence highlighting an increase in drownings of people from Arab nations. 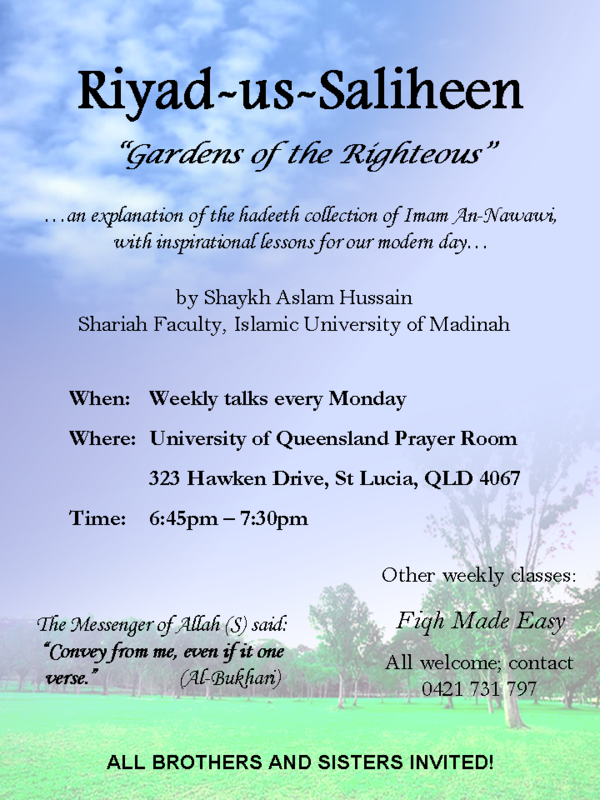 Latest releases from Audio Islam are available for immediate download. 1. 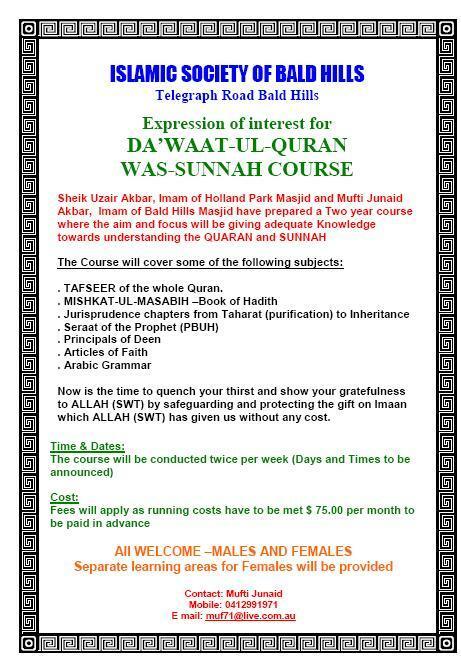 Ml Ismail Abdur Razzaq - 2 lectures in 1 - Aquisition of Knowledge & Imaan Mufassal. 2. Ml Sulaimaan Mulla - 5 Great Women. 3. Ml Sulaimaan Kattani - Heart-beat for Allah. The MBN Dinner kicked off early in the afternoon last Sunday at the RNA Showground where some 450 diners were entertained to nasheeds, naats and qira'ats and lucky draw prizes that saw winners walk away with a television set and airplane tickets to Malaysia. 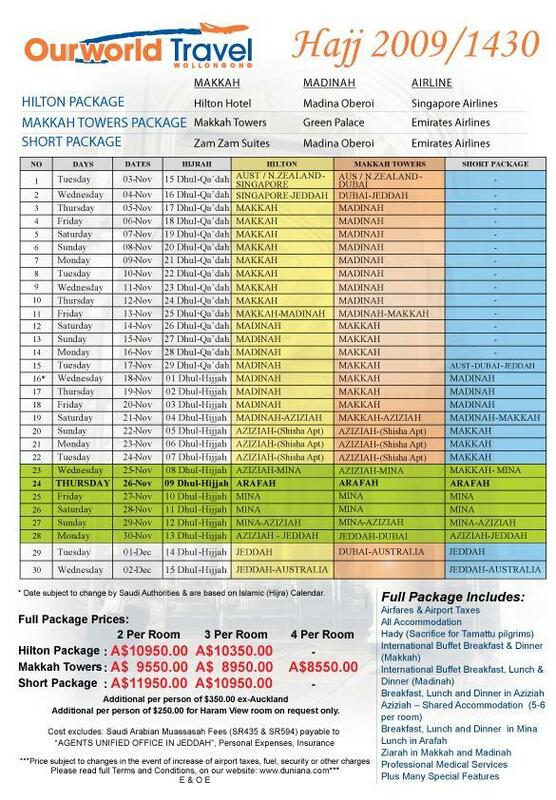 The latest edition of the Al-Ghazalli Newsletter of the Sydney-based Al-Ghazalli Centre can be viewed here. BRISBANE'S Muslim community leaders came face to face with guide dogs in training, as part of a campaign to convince them the animals are not "unclean''. The education forum at the Bald Hills guide dog training facility followed controversy over some cab drivers refusing to carry blind and disabled passengers with guide dogs. "Quite a few cab drivers are Muslims and many of them are reluctant to have dogs sitting in the cabs because there's a belief that if their saliva gets on to stuff it bec omes unclean,'' said Guide Dogs Queensland board director Rasheed A Ali. 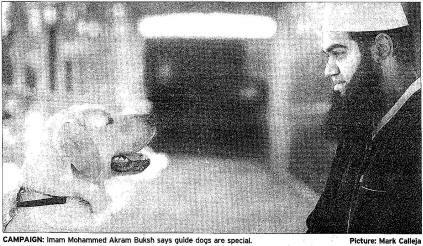 Imam Mohammed Akram Buksh, from Kuraby Mosque south of Brisbane, agreed, saying Islam permitted the use of dogs for specific purposes. "These dogs are very special dogs in the sense that they are trained for a specific purpose to guide people through their daily life, which of course Islam permits,'' Imam Buksh said. Mr Ali said Guide Dogs Queensland hoped the education forum could lead to a formal religious edict, or fatwa, governing the interaction between Australian Muslims and guide dogs. Imam Buksh said other mosques had made arrangements for vision-impaired members of their congregations, and the same could happen in Australia. "It is our job to accommodate them - we have to make arrangements where to keep the dogs, and I'm sure we will organise special facilities with them,'' he said. The Ethnic Communities Council of Queensland (ECCQ) will be hosting its annual Multicultural Summit at the State Library of Queensland on October 26 and 27. 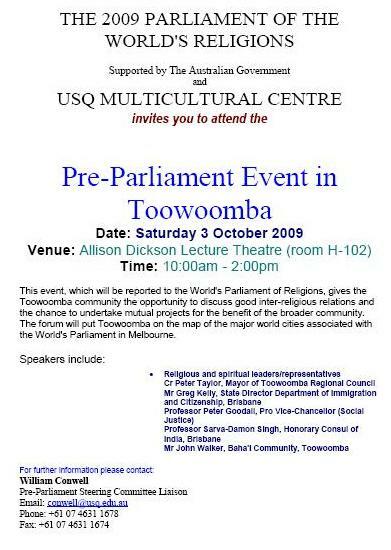 Multicultural Affairs Minister Annastacia Palaszczuk will deliver the opening address, Jason Yat-Sen Li flies in from Beijing for the Day 1 keynote address; Phillip Adams will be the Day 2 keynote speaker and moderator for the Great Debate (on the panel are Prof Hurriyet Babacan, Prof Ken Wiltshire, Jill Lang from QCOSS, Susan Booth from the ADCQ and The Courier-Mail�s Margaret Wenham) and plenary speakers include Andrew Metcalf, Secretary of the Department of Immigration & Citizenship; Garry Page, Executive Director of MAQ; and former Senator Andrew Bartlett, now ECCQ�s Policy & Advocacy Advisor. Ian Muil, ECCQ Manager, told CCN: "This year's programme will make this an exciting Summit which we believe will stand out for a number of reasons, just one being the development of a Summit Declaration at a time that the issue of multiculturalism is under the microscope at both national and federal levels." You can download the registration form or register online. 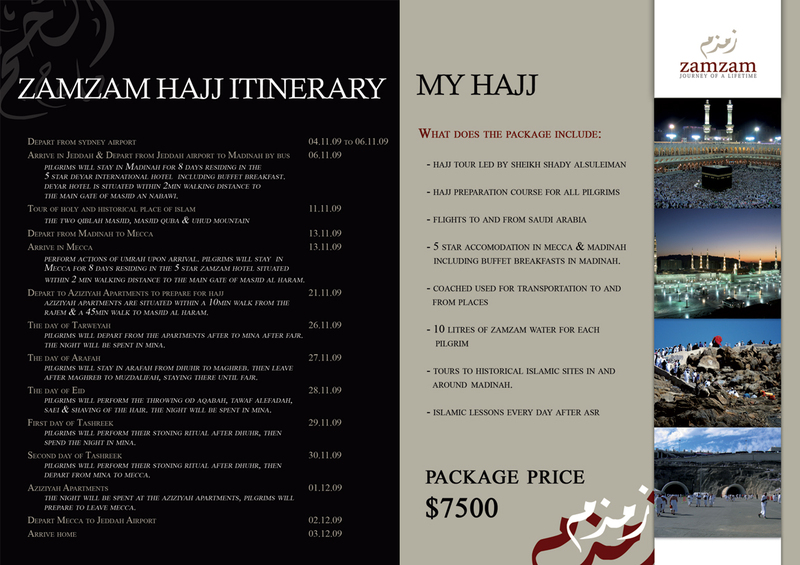 Study the Soundvision online guide if you are preparing for Hajj. 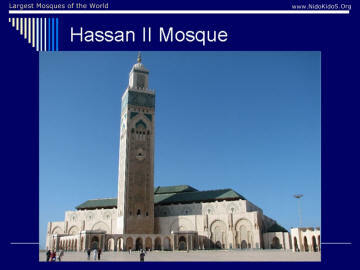 It features a glossary of terms and general and specific information about this pillar of Islam. 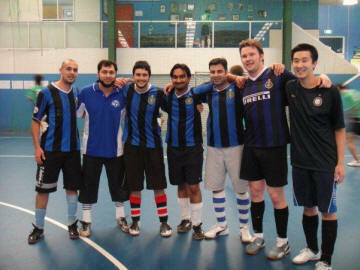 I have been playing indoor soccer at West End and now at Acacia Ridge for 6 seasons with the MatchFixers team. We�re had a pretty close team and the core of the original team still plays together on Tuesday nights. I saw a competition on Foxtel to win a trip to the UK to meet Tim Cahill. So I submitted an entry with a video of our first season triumph. This video was put together by one of our ex-players who doesn�t play for us anymore due to injury, Shadab Aizaz. I ended up being one of winners of this competition and decided to take along with me my close friend Sohail Asghar to his surprise as he had no idea I had entered such a competition. We flew out to London Friday 18th September. Landed in Heathrow where we were met up with the other winners plus ex-Socceroo Robbie Slater who was going to be our guide on tour. We got on a bus and drove up the M4 up to Liverpool. 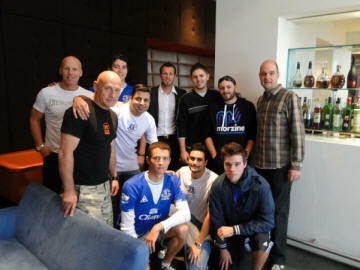 At our hotel we were surprised to find that the Blackburn Football Team was also staying at our hotel. Thanks to Robbie Slater, we managed to mingle with Socceroos Brett Emerton and Vince Grella and get some happy snaps and gear signed. All the winners from the Sony Twilight competition with Robbie Slater and Socceroo captain Lucas Neil. The next day we met up with Australian captain and Everton�s latest signing Lucas Neil, who we also got some photos and signed some gear. We then went for a tour of the famous Anfield stadium. Later, Tim Cahill had arranged some tickets for us to watch the Everton-Blackburn match at Goodison Park, which was a great experience especially as Everton won 3-0. Next morning was our special meeting with Tim Cahill. We arrived at the Everton training ground in Finch Farm early in the morning for our meeting. As we were getting off our bus we saw Tim Cahill zoom past us in his Lamborghini. He greeted us all and made us all feel really comfortable around him. He was obviously in a much happier mood as they had just won the day before. He spent about an hour and a half with us answering our questions and giving us a personal tour of the Everton Training ground. He showed us their dressing rooms (he passed around his boots which have an Australian flag on them and the names of his two girls, their gym (where we saw some of the Everton boys), their outdoor field (where a few of the boys were training including Lucas Neil for the first time), their indoor field (for when it rains which is does a lot), their kit room, their store. He spoke to us about how professional the players are. They train three times a day. They don�t drink and they have a strict eating regime. Their every movement on the pitch is monitored and at the end of the game they get statistics to tell them how many metres they covered, how many passes them made/lost, etc. They have tough times when things aren�t going well and they are struggling for form, but they keep working harder to improve. They get paid well but they have to work hard to get there and maintain that high level. But he loves it and is passionate about it. We spoke about the Aussies preparation for the World Cup in South Africa and he truly feels that the Aussie team could do something really special this world cup, but for now he wants to concentrate on his club Everton and to help them get up the Premier League ladder. He came across as just a regular guy and really down to earth, no arrogance at all. He was real generous to give us such a tour, as apparently he has only done something like this once before and that was for charity. After saying our goodbyes to Tim and wishing him all the best for the season and the World Cup next year, we headed off to Manchester for a flight down to Plymouth. Near Plymouth Sony had arranged a 4 a side football game at a picturesque location amongst the ruins of King Arthur�s Tintagel Castle. We cheered on as the Australian team captained by Robbie Slater beat a Brazilian team 10-6. The last day was a free day which we spent touring around London and catching sights such as Buckingham Palace, Westminster Abbey, Trafalgar Square and the London Eye. We arrived back on Saturday 26th September very jetlagged but still in a buzz after an unbelievable trip of a lifetime. I'm a photographer based in Brisbane. 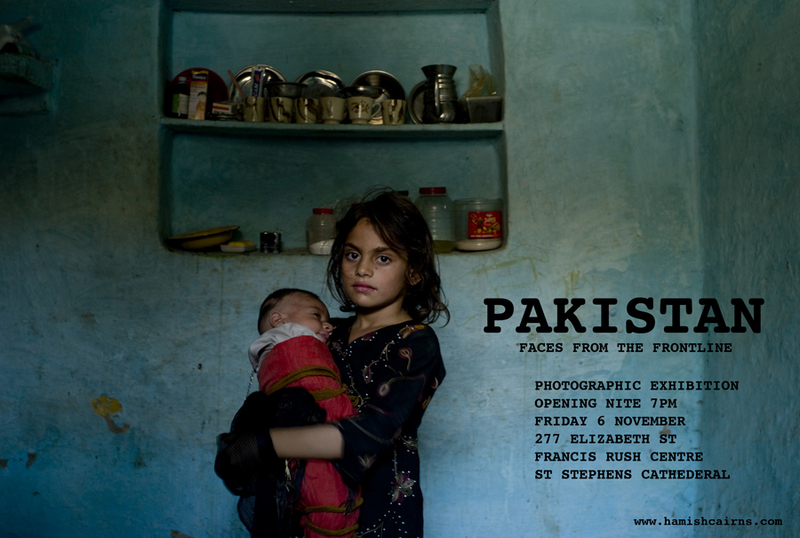 I have recently returned from Pakistan and I'm holding an exhibition of photographs to raise awareness and let people know what is happening on the ground. 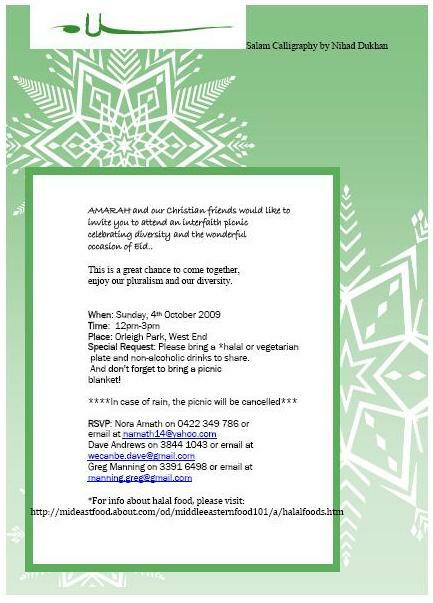 I would like to invite you all to attend. I'm also looking for any traditional Pakistani musicians, do you know of any in Brisbane? If I can be of any assistance in the future please let me know. UK: London has become one of the biggest centres for Islamic finance in the world, with five Islamic banks, and many others in the high street offering Islamic financial products, or "windows" as they are known. The growth of Islamic finance has been an unexpected outcome of the attacks on the World Trade Centre of 11 September 2001. Islamic finance is based on rules from Islam's holy texts - the Koran. Scholars claim the fundamental difference to conventional banking is that Islamic finance is more ethical. First it bans any form of "riba" or interest, preventing consumers being exploited by high rates of borrowing. Secondly, it regards speculative trading as sinful. One of the world's leading experts on Islamic finance, Sheikh Hussain Hassan (pictured left), argues the whole crisis in Western banking could have been avoided if these basic sharia principles had been followed. He said: "$600 trillion were wasted on options, futures and derivatives, all gambling. Sharia prohibited these kind of risks 14 centuries back." 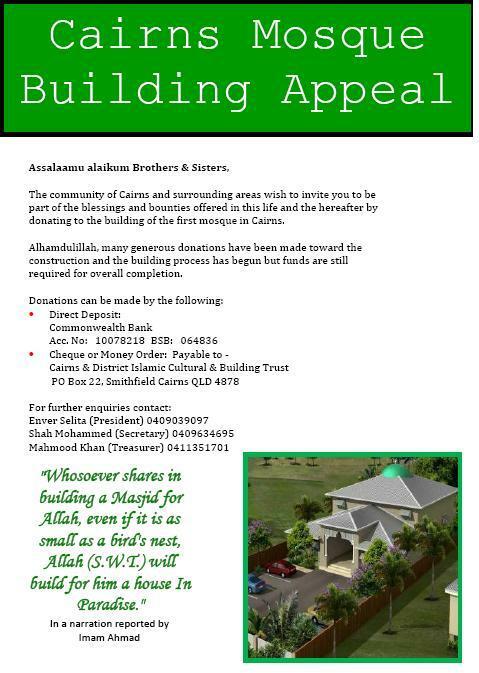 Some Muslims regard ordinary mortgages as sinful. The idea is for the lender and the borrower to share the risk. 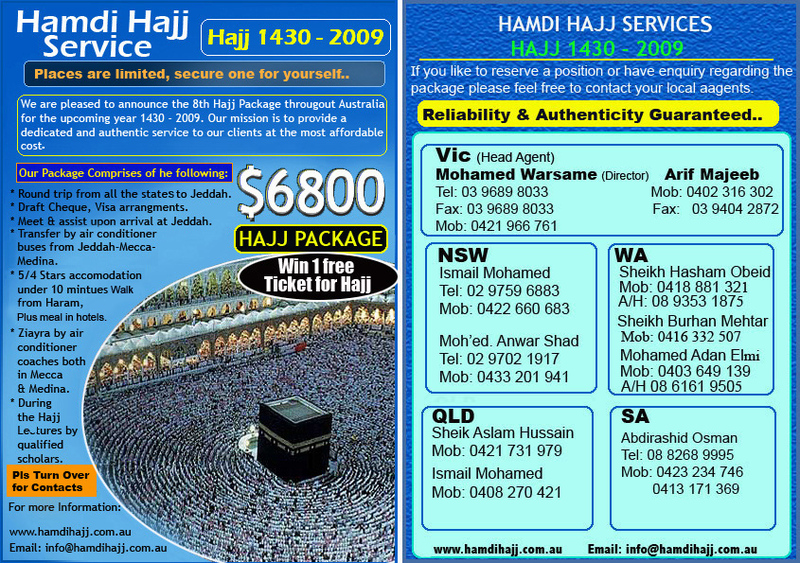 There are now more products on the market which help Muslims buy a house without paying interest. The most common form of Islamic home purchase loan works like this: When a couple wants to buy a house, instead of borrowing the money, the Islamic bank buys 80% of the house for them. The couple puts down a deposit for the other 20% and then pays the bank rent, plus regular portions of the capital. During the fixed period, ownership gradually passes from the bank to the buyer. The rent charged by the bank is how it makes its money. If the borrower loses his job and defaults on the payments, under sharia law it is very difficult for the family to be thrown out of their home, as that would be seen as a creditor exploiting a debtor. These interest-avoiding transactions can work on a bigger scale as well. The old Chelsea Barracks in London was bought by the Qatari government for nearly �1bn - the biggest residential property deal in the UK. The entire transaction was done under sharia pinciples, with contracts drawn up by lawyers at Norton Rose. Farmida Bi, one of the law firm's partners, explained that London has attracted this kind of investment because the British government wooed Islamic money in the wake of 9/11, at the expense of the US. "It was really September 11th that made being a Muslim a political statement and not just a matter of personal faith," she said. "And with the Patriot Act, which made investments in the US difficult for many Islamic investors, there was a significant increase in Islamic investors choosing to invest in Islamic institutions and Islamic products." So while groups in the US were investigating terrorist connections with Islamic banks, Muslim investors pulled their money out of America. Some of the money got diverted to London, which had traditionally been a banking centre. The British government then helped further by changing regulations to give sharia-compliant funds a level playing field with conventional ones. It was really September 11th that made being a Muslim a political statement and not just a matter of personal faith. Farmida Bi explains why London is now attracting Muslim investment. Riyadh: Over 600 Chinese nationals working on the Haramain Rail project have embraced Islam in a recent ceremony in Makkah. They are workers of the Chinese Railway Company, which won the multibillion contract for implementing the 450km rail road linking the holy cities of Makkah and Madinah via Jeddah and Rabigh. Dr. Abdul Aziz Al Khudhairi, undersecretary at the Makkah Governorate, said that this year�s celebration of the Kingdom�s National Day coincides with a number of auspicious and historic occasions. These included launching of the prestigious international research university - King Abdullah University for Science & Technology (KAUST), celebration of Eid Al Fitr and a recent ceremony of Chinese workers pronouncing their Shahada. Among the converts, there are 70 workers who are engaged in the construction of Makkah monorail project, which links the holy city with the holy sites of Mina, Muzdalifa and Arafat. �Their conversion took place 24 hours after getting books introducing Islam in Chinese language at their worksite at Arafat, which is outside the Haram area,� he said adding that the credit goes to the Office of the Call and Guidance for Expatriates in Makkah. Efforts are underway to spread the message of Islam among some 5,000 Chinese nationals working on the Haramain train,� he said adding that the major problem for the Call and Guidance Office is the lack of enough books on Islam in Chinese language. It is noteworthy that the first phase of Haramain Rail consisting of 70km has well been started a few months ago. This represents expropriation of land, filling works, construction of bridges and tracks. The project is expected to be operational in 2012. Vice President, Prime Minister and Ruler of Dubai His Highness Sheikh Mohammed bin Rashid Al Maktoum received German Muslim Scholar Dr. Murad Hoffman at Al Marmoum resort recently. Dr. Hoffman has been selected as the Islamic Personality of the year for the 13th Dubai International Holy Quran Awards. Sheikh Mohammed congratulated the German scholar on the occasion and expressed his appreciation for Hoffman�s efforts to advance Islam as a religion of tolerance and love through his research, writings and ideas. Dr. Hoffman praised the awards� objectives and expressed pleasure about his selection as the Islamic personality of the year. Present at the meeting were Dubai Deputy Ruler Sheikh Maktoum bin Mohammed bin Rashid Al Maktoum, Sheikh Mohammed�s Adviser for Cultural and Humanitarian Affairs Ibrahim Mohammed Bumelha, the Holy Quran Award Organising Committee Chairman and a number of senior officials. Murad Wilfried Hofmann born in Germany in 1931 studied law both at Harvard and Munich Law School. For 33 years he worked in the German Foreign Service and was Ambassador to Algeria and Morocco. In 1980, he embraced Islam and became a (Sunni) Muslim. 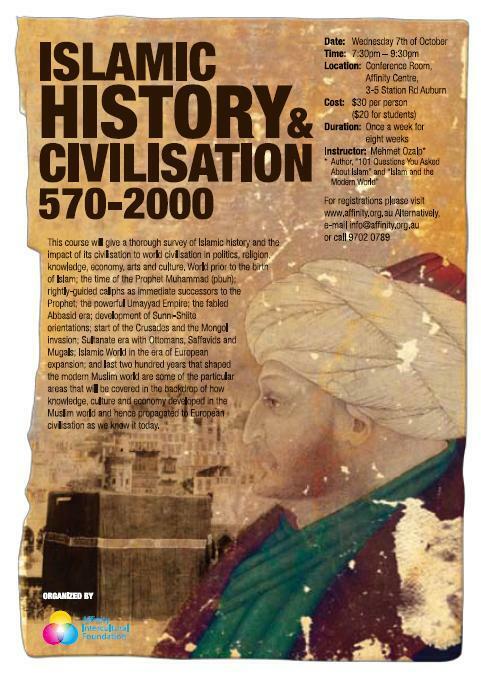 He has written many articles on Islamic topics in leading magazines and has authored a number of books that include Diary of a German Muslim, Islam: The Alternative, Voyage to Mecca, Islam 2000, Religion on the Rise-Islam in the Third Millennium. 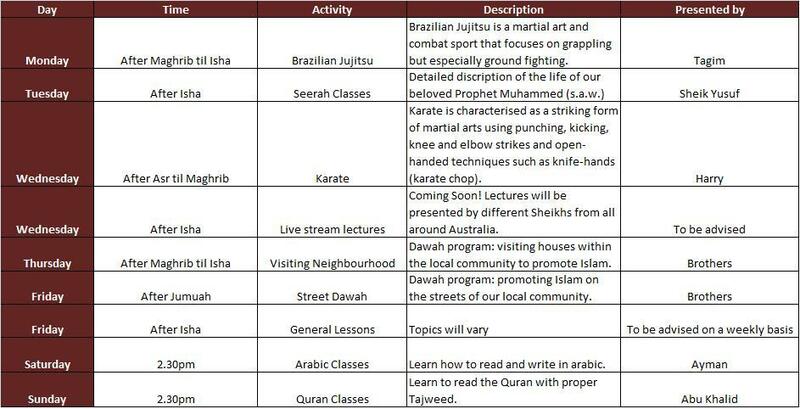 Presently Dr. Hofmann lives in Bonn (Germany), giving lectures on Islam in many parts of the world. CCN can now twitter too! Extraordinary stories can sometimes be found in ordinary letters. This is the discovery that awaits readers of this gentle and beautifully written correspondence between a political prisoner and a self-described housewife during apartheid�s last decade. 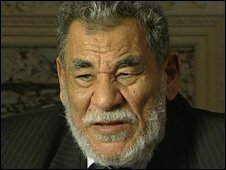 The circumstances of loss prompting Rivonia trialist Ahmed Kathrada to write a letter of sympathy to a former flat-mate Abdulhak �Bis� Bismillah are met with an unexpected reply from Bis�s sister. 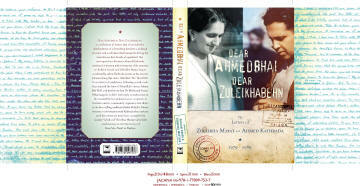 Zuleikha Mayat, a Durban community organizer and editor of the best-selling cookbook Indian Delights, initiates a correspondence with Kathrada that continues until his release ten years later. Virtual strangers, they have in common their small-town Transvaal childhoods in Muslim shops in the early 20th century; and they find much to explore in their different approaches to questions of culture, politics and religion. The letters are written with wit and style, as they discuss both the issues of the day and the sustenance found in memory. These letters tell the story, all the more powerful for its ephemeral character, of a developing epistolary friendship between two people to whom history has brought different gains and losses. The collection is rich not merely in historical content and stylistic interest, but in the experience it offers to the reader of an unfolding conversation, reflecting both the immediate worlds of its authors and a tumultuous period of South African history. 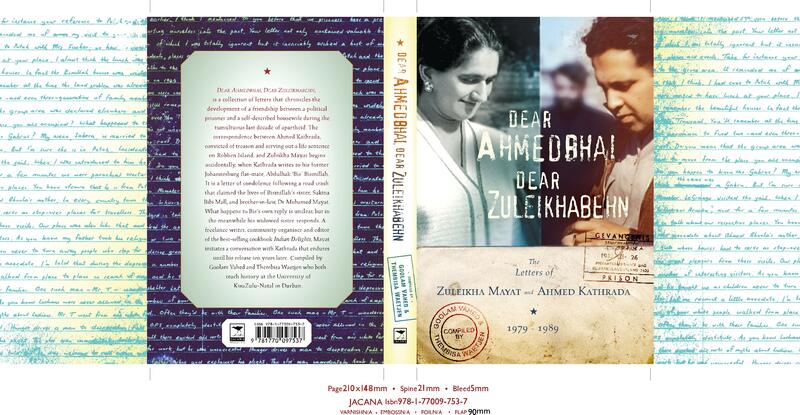 This compilation of letters is an apt celebration of Ahmed Kathrada�s 80th birthday this year (see CCN251 for a coverage of the celebrations), and presents a rewarding portrait of Zuleikha Mayat, a woman who is a household name, as the �Betty Crocker� of South African Indian cuisine. 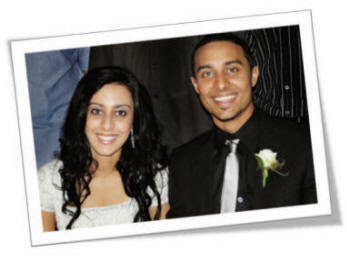 Goolam Vahed (no stranger to Brisbane) and Thembisa Waejen teach history at the University of KwaZulu-Natal in Durban. Preheat oven to 375 degrees and bake eggplant for 30 minutes, or until outside is crisp and inside is soft. Allow to cool for 20 minutes. Cut open eggplant and scoop out the flesh into colander and allow to drain for 10 minutes. Removing the excess liquid helps to eliminate a bitter flavor. 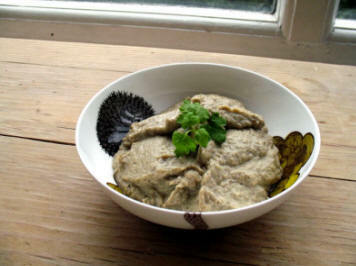 Place eggplant flesh in a medium bowl. Add remaining ingredients and mash together. You can also use a food processor and pulse for about 2 minutes. Place in serving bowl and top with lemon juice and olive oil. Add other garnish according to taste. Baba ghannouj always has to have olive oil on top for garnish. However you can spice things up a bit by adding crushed red pepper, a dash of cumin, parsley or coriander. Send in your favourite recipe to ccn@crescentsofbrisbane.org and be our "guest chef" for the week. Dear Kareema, are you able to give us a few training tips, especially for people like myself who has been exercising for a while and need to stay motivated? You'll find that tired exercise routines bore your body and stunt fat burning. Try to alter the emphasis of your training every 6 - 8 weeks. You can change from slower to more intense efforts and / or emphasise on weights, or take up a few different exercise classes if you have a gym membership. This will stop your mind and body getting bored from performing the same training and will constantly stimulate your fat-burning efforts. Cutting back on junk food or walking for a few extra minutes each day, could be all you need to tip your fat-burning scales back to a positive energy balance. Remember the 70 - 30 ratio (70% diet to 30% exercise). It's not all about exercise, a healthy diet will compliment you exercise regime. Enjoy your workouts - think long term, and positive adaptations will come! Jalalludin, a strong young man, was bragging that he could outdo anyone in a feat of strength. He made a special case of making fun of Mula Nasruddin, one of several older men sitting around enjoying their baklavas. After several minutes, Mula Nasruddin had enough. "Why don't you put your money where your mouth is?" Mula Nasruddin said. "I will bet you a doner kebab that I can haul something in a wheelbarrow over to that outbuilding that you won't be able to wheel back." "You're on, old man," Jalalludin replied. "It's a bet! Let's see what you got." Mula Nasruddin reached out and grabbed the wheelbarrow by the handles. Then, nodding to Jalalludin, he said, "All right. Get in." 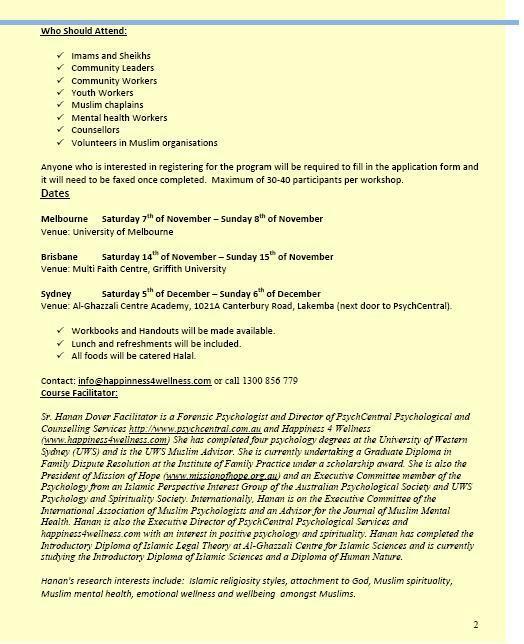 "Celebration of being a woman"
Sunnah Inspirations is a non-profit organisation to cater for Muslim social support and supplying information to Muslims and non-Muslims. 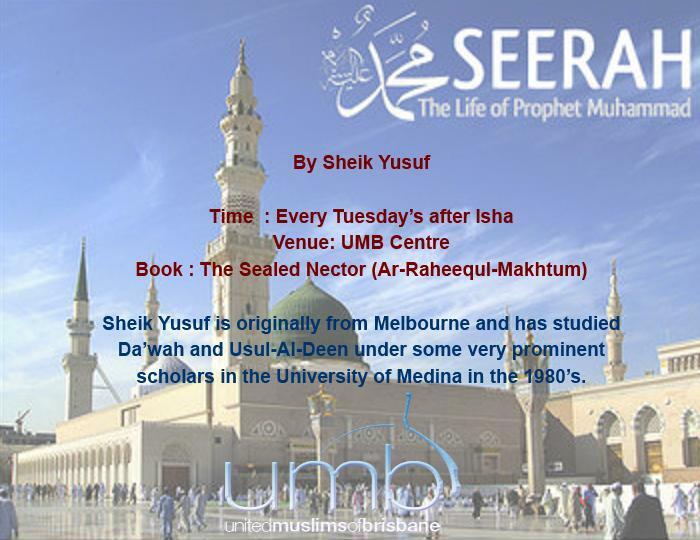 They have been doing various activities around Australia, and have organised Da'wah information stalls at various universities in Brisbane. 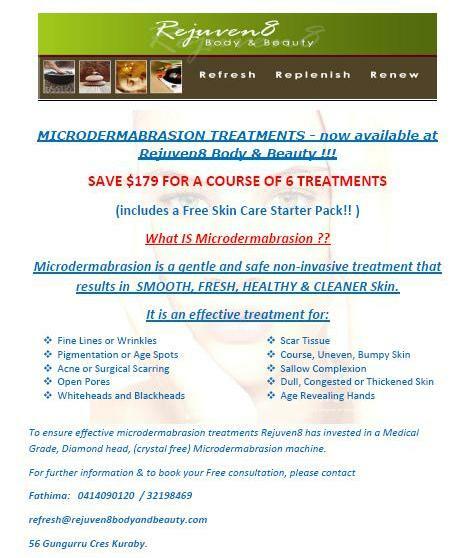 More info can be found on their website above. 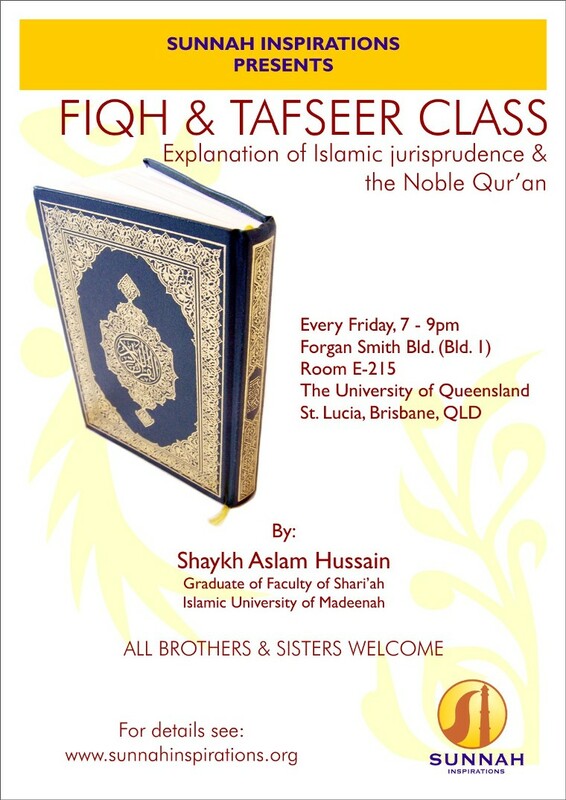 Queensland Muslim Historical Society Inc. 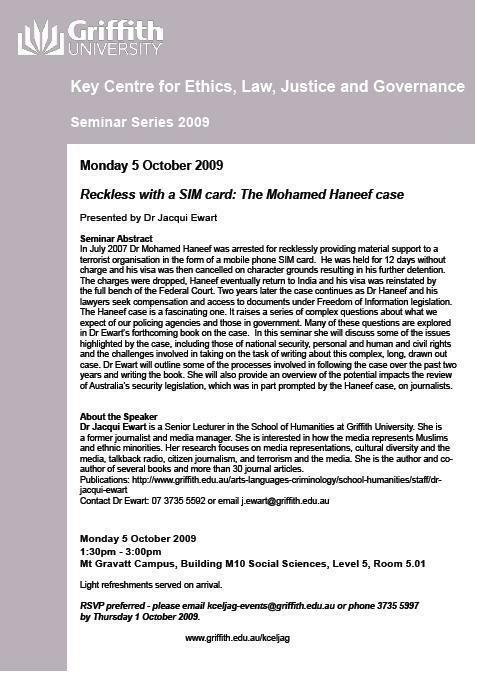 Articles and opinions appearing in this newsletter do not necessarily reflect the opinions of the Crescents of Brisbane Team, CCN, its Editor or its Sponsors, particularly if they eventually turn out to be libelous, unfounded, objectionable, obnoxious, offensive, slanderous and/or downright distasteful.